The Triangle: More to it than a polygon with three sides. The triangle is indeed fascinating for the fact that it is so simple a figure to have inexhaustible properties and theorems associated with it. Leaving the world of geometry behind, the triangle still has many mysteries and tales to tell. A complete paradigm shift into the field of Management and Organisational Behavior will lead us to what I would consider one of psychology’s best theorys’ proposed by Abraham Maslow, “Maslow’s hierarchy of needs”; and is something which im more interested at this point of time. 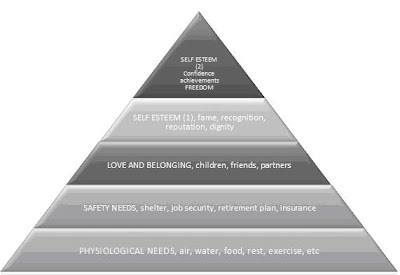 Wikipedia has a whole lot of information relating to this, the crux of the matter being: people have needs starting from the lower level deficiency needs to growth needs which they realize with time until they reach a level of self relisation/actulisation. Maslow’s hierarchy of needs would apply to induviduals, but there probably could exist (or coexist!!) another triangle that could represent organizational structure, the apex being the chief, and the base of the triangle being the naïve new entrants to the organization. The employees at the base are the ones who have physiological and safety needs, they probably would want to first attain a state of financial stability and responsibility, slightly sidelining the other ambitious desires and needs. Progressions up the organization however fast or slow paced it might be, would take the individual to a state where his safety needs are satiated and then would arise the previously sidelined growth needs, till superiority is attained. The best of the organizations’ would have a common goal and its employees would work towards the same in which case these two triangles shoud coexist. This could probably also justify the base for my comparison between the triangles of an individual’s needs and an organization’s structure. As the organization grows in terms of manpower, maintaining the linearity of the leaning sides of the triangle would be a challenge for reasons more than one that needs to be addressed. Probably with time I might be able to figure out factors that influence the linearity of the leaning sides’ or probably end up justifying that a bulge in the organisational structure is the only profitably feasible way. The bottom line is however the fact that both the employees’ needs and the organizations’ goals are to be satisfied and that is what makes a successful organization and also a great one to work for. There are already a couple of new thoughts in my mind right now, but ill put them here later, till then, its black, white and everything in between.